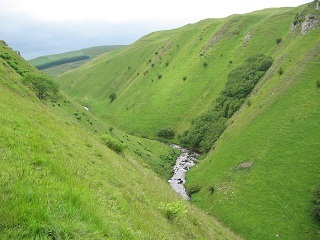 In mid June, a select group of recorders visited Tinnis Stiel and Lewenshope Burn along the Yarrow valley west of Selkirk. This is a large complex (5 compartments) of woodland and hazel scrub along the Yarrow Water with riparian woodland, wet grassland and pasture north of the A road. Hazel coppice. Photograph courtesy of Sarah Eno. Tinnis Stiel Wood, on the south side of Lewenshope Burn, is an interesting fragment of woodland comprising old, open coniferous plantings. On the far southern edge of the woodland there was a steep drop down to the floodplain of the Yarrow. This bank was of considerable interest as it consisted of old coppiced hazels and oaks (Quercus petraea). The ground flora was rather uniform as the site has been grazed in the past but the local grass Wood Melick (Melica uniflora) was dominant over some quite large areas and Hairy St John's-wort (Hypericum hirsutum) was conspicuous in places. Wood Sedge (Carex sylvatica) was scattered through the woodland but Primrose (Primula vulgaris) was very local and the fern Polystichum aculeatum was rare. Surprisingly, Bluebell (Hyacinthoides non-scripta) appeared to be absent from this steep section of the wood and was only seen as a moderately sized colony in the planted part. Wood Speedwell (Veronica montana), another old woodland species, was local by the burn with Wood Forget-me-not (Myosotis sylvatica), Enchanter's Nightshade (Circaea lutetiana) and impressive stands of ferns. The trees had a good lichen cover of common species such as Evernia prunastri, Usnea subfloridana and Parmelia sulcata, but there were no old forest indicator species present. The bryophyte cover of the trees was impressive, especially that on Ash. Large circular colonies of Frullania dilatata were conspicuous on the trunks and the twigs and branches had large healthy tufts of Ulota crispa, Orthotrichum affine and rarely O. stramineum. At the base of one ash, Porella platyphylla and Radula complanata were seen. Nowellia cavifolia was abundant on a rotten log at the top of the bank. Oak tree covered in lichens. Photograph courtesy of Sarah Eno. The open section of Lewenshope Burn, on the north side of the public road, comprised track, burn side and wet meadow habitats. In this part of the site there was a more diverse flora with base-rich conditions shown by Burnet Saxifrage (Pimpinella saxifrage) and Lady's Bedstraw (Galium verum). Of note was the local sedge Carex laevigata with Marsh Speedwell (Veronica scutellata) in the western section and the only orchid of the day, Common Spotted-orchid (Dactylorhiza fuchsia). The track itself had the colonisers Sand Spurrey (Spergularia rubra), Black Medick (Medicago lupulina) and Thyme-leaved Sandwort (Arenaria serpyllifolia). 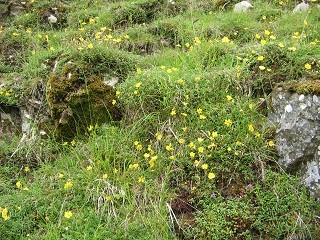 On the east side of the track was a bank with species indicative of basic conditions, such as Glaucous Sedge (Carex flacca), Common Rock-rose (Helianthemum nummularium) and Rough Hawkbit (Leontodon hispidus). An added bonus was the presence of a single Small Pearl Bordered fritillary butterfly on the wetter part of the bank. 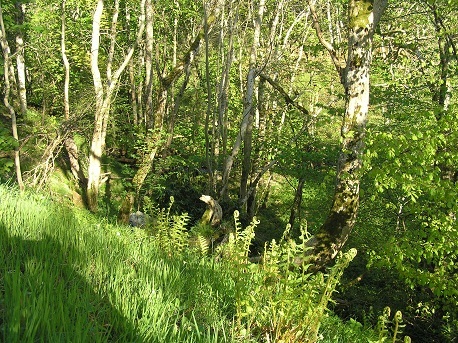 The upstream wooded section of Lewenshope Burn is a remnant of ancient forest with some fine old ash trees, alder and a number of large old hazels at the northern end. The ground flora was poor owing to grazing pressure, but the notable species, Pale Sedge (Carex pallescens) was seen. Also of note was the presence of the rare moss Antitrichia curtipendula on one ash and the epiphytic lichen Lobaria pulmonaria. Towards the northern end, one ash had the hepatic Porella platyphylla on the base and the moss Neckera complanata. There was a good covering of lichens on the trees with conspicuous Platismatia glauca, Usnea subfloridana and Evernia prunastri. Of the bryophytes Frullania spp. and Ulota crispa and Orthotrichum affine were common. Sadly, the moss Antitrichia had decreased almost to the point of extinction since Rod's visit in 1991 and is unlikely to be retained for much longer given its present precarious state. Overall, the trip had provided a good day's botanising with some interesting finds. It is hoped that further visits might undercover more of the fauna present on site. A party of 7 recorders assembled for the day's outing to Leap Linn, an unusual little ravine in the Borders rolling countryside. The site is situated on an igneous intrusion and comprises a mixture of unimproved grassland, exposed rock faces and scrub. It was remarked that the inaccessible nature of the site had likely been its saving grace; as agricultural machinery would never be able to transverse the slopes. As a result a diverse grassland flora remains today and the site boasts strong colonies of Common Rock Rose, the food plant of the Northern Brown Argus. Despite the timely advice of our excursion leader, Sarah Eno, to bring a stick to aid with balance on the slopes, I do not think any of us appreciated how steep the valley sides were until we saw them for ourselves! We made our way to the most westerly part of the site and started our exploration of the north-west bank. Here the turf was short and we recorded a variety of wild flowers and grasses including Mountain Pansy (Viola lutea), Meadow Crane's-bill (Geranium pratense), Pignut (Conopodium majus), Quaking Grass (Briza media), Bitter Vetch (Lathyrus linifolius) and Wavy-hair Grass (Deschampsia flexuosa). There was clearly a base-rich influence in parts with Thyme (Thymus praecox) and Common Milkwort (Polygala vulgaris) occurring. The group soon split into two camps, with Teyl and Roy making a beeline for the river bank, while the rest of us made a more gradual progression along the upper slopes, with Sarah pointing out some of the key identification features of various plants for the benefit of those of us who were less familiar with botanical identification. After making our way along the lower slopes we carefully crossed the burn and ascended the other side of the ravine. It was noticeable that the vegetation was much more luxuriant on this south-east facing side of the burn, although the mix of species was essentially similar to the vegetation community on the opposite bank. There was much excitement when we found the rare Prickly Sedge (Carex muricata) in abundance in the sward; an identification that was later confirmed by Rod Corner. Lunchtime was spent perched on the grassy slopes amongst the Rock Rose and Thyme. Later in the afternoon we had a tantalising glimpse of a fritillary butterfly beside the Ale Water, but were unable to track it down to identify it. Other butterflies we saw during the day included the Northern Brown Argus, Small Copper and Ringlet. On the river banks we saw clumps of Common Spotted Orchid (Dactylorhiza fuchsii) and Northern Marsh Orchid (Dactylorhiza purpurella). The hemi-parasitic plant, Yellow Rattle (Rhinanthus minor) was also present. There were also healthy populations of Melancholy Thistle (Cirsium heterophyllum) to the east of the site. 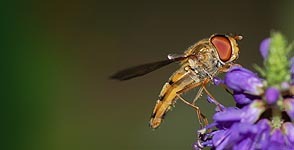 At the end of the day in excess of 100 vascular plant species had been recorded, as well as more modest numbers of birds, invertebrates, moths and butterflies. In my mind, there was no question whether this site should be awarded the Local Biodiversity Site status given its special biodiversity value. The end of August should be a pleasant time to explore the eastern Lammermuirs. The risk assessment certainly identified the possibility of sun burn in the enclosed glen, but the strong cold winds meant that every layer of clothing was needed. 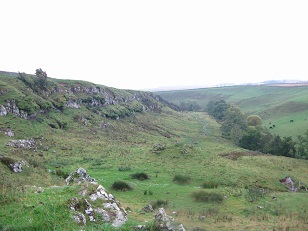 The generic rock-type of the area is conglomerate which produces steeply eroded glens (cleuchs) and rocky outcrops. 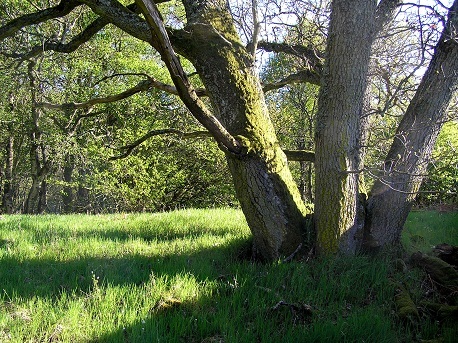 This supports a mix of grassland, woodland and wetland. 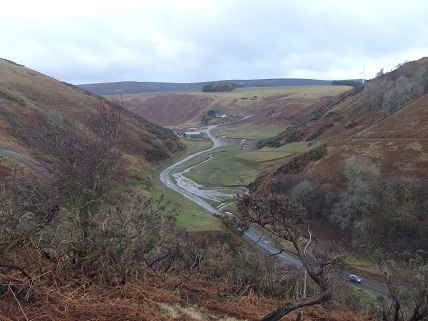 View of Aikengall Glen earlier in the season. Photograph by Gill Christie. Much of the east side of the glen was covered with gorse. Ordinarily, this may have been ringing to the sound of linnets and stonechats, but the weather kept most sensible animals under cover. We did find two bedraggled day-flying moths, Udea lutealis and Hydriomena furcata (a little ironically called the July highflier) which pleased the lepidopterist in our party (Barry Prater). Apart from that highlight, however, his efforts with a net were in vain. Some grassy flushes squelched down the glen side supporting Fairy Flax (Linum catharticum) Devil's Bit Scabious (Succisa pratensis) and Butterwort (Pinguicula vulgaris). The botanically best area was a narrow wet gorge through which we had to force our way through fallen debris. Ultimately, our passage was blocked by a waterfall. Hard Shield Fern (Polystichum aculeatum) and Brittle Bladder Fern (Cystopteris fragilis) were two species of note, but Wood Melick (Melica uniflora), Primrose (Primula vulgaris) and Woodruff (Galium odoratum) suggested that a quality woodland flora could be found earlier in the year. Exuberant moss growth also indicated that this gorge in particular was worthy of further study. A small loch formed part of another tributary and again we had to force our way through dense under-growth to the woodland canopy. This actually turned out to be an overgrown hornbeam hedge extending as a northern boundary to the glen, a hint of the more formal landscape in times past. The loch is not an ancient habitat being absent from the 1894 map of the area. It was dominated by Amphibious Bistort (Persicaria amphibia) but also supported Spike Rush (Eleocharis palustris) and Pond Water-crowfoot (Ranunculus peltatus). The surrounding area comprised neutral grassland with abundant Field Mouse-ear (Cerastium arvense) on which the local rabbits earned a meagre living. Jackie Muscott observed that the area looked much as it did when she last visited the loch 25 years earlier, so some habitats obviously remain relatively unchanged. This tributary also offered the opportunity to fill in a gap in the Phase I Habitat Survey for East Lothian. Despite the conditions, and partly because of them, it was a very enjoyable day of exploration and recording, unless, perhaps, you were a lepidopterist. After a less than promising start to the day, a dozen or so Recorders met at the Hundy Mundy Green Burial site car park for the final excursion of the season. David Long gave a brief introduction to the geology of the site. Little Thairn and Muckle Thairn is part of the Kelso traps, a group of igneous intrusions north of Kelso, and contains one of the few dry grassland sites in the area. 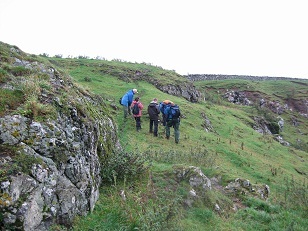 We then headed for the rocky outcrops and started our exploration for moss and liverwort species. It turned out that a number of the group were relatively new to bryophyte recording, so David pointed out differences in the form and habitat requirements of different taxa. Some common mosses we became acquainted with included the ubiquitous Rhytidiadelphus squarrosus, which has attractive-looking star-like shoots; Scleropodium purum with its neat pinnate form and pale green colouration and the Hypnum group, which have strongly curved leaves, somewhat akin to bird's talons. The largest number of species was identified in the part of the site called Muckle Thairn, where the volcanic outcrops were exposed. Here we saw Anomodon viticulosus, Homalothecium lutescens, Leucodon sciuroides, Pterogonium gracile, Syntrichia ruralis and the cushion-forming species Grimmia pulvinata. Little Thairn provided fewer additions to our species list, since large parts had been colonised by scrub. Along the Eden Water Leskea polycarpa and Syntrichia latifolia were growing on silty bases of Alder trees. By close of play we had compiled a species list of 60 bryophytes, 20 of which were new to the site. 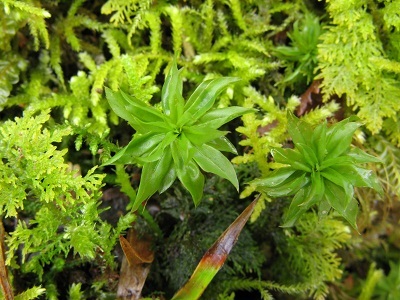 The most notable of these new bryophyte records was the calcareous grassland species Rhodobryum roseum (Rose-moss). Other taxa were recorded on the day, including vascular plants, waxcap fungi and birds. The list of flowering plants included Great Lettuce (Lactuca virosa), Rock-rose (Helianthemum nummularium), Musk Mallow (Malva moschata), Field Madder (Sherardia arvensis) and Meadow Saxifrage (Saxifraga granulata). We were also treated to an excellent view of a Brown Hare on the return leg. 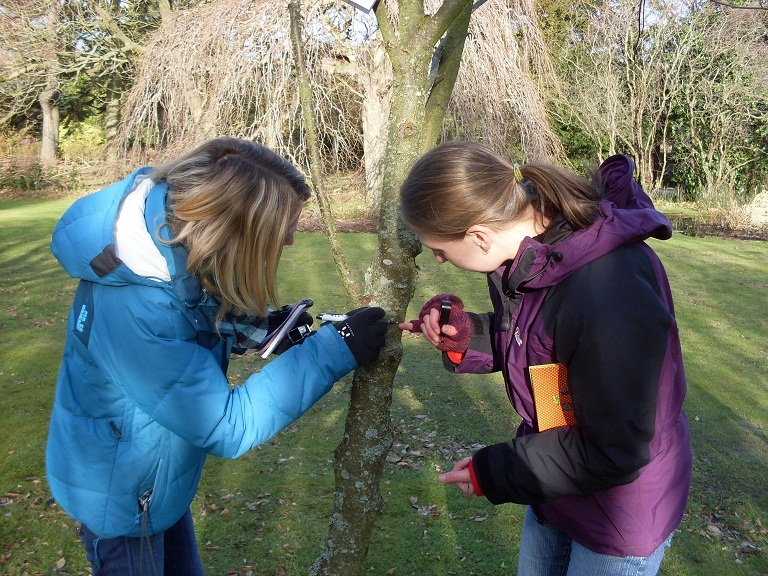 In January and February 2011, TWIC ran five free ID and data mobilisation workshops across Scotland in partnership with four other Local Records Centres and Centres for Biological Recording throughout Scotland: Dumfries and Galloway Environmental Records Centres (DGERC), North East Scotland Biological Records Centre (NESBReC), Glasgow Museums Biological Records Centre (GMBRC) and the Highland Biological Recording Group (HBRG). The workshops were funded by the NBN Trust. The aim of these workshops was to train Recorders in taxonomic groups that were unfamiliar to them and target regions where there was a lack of expert recorders in a particular taxon, thereby encouraging more recording of these groups. 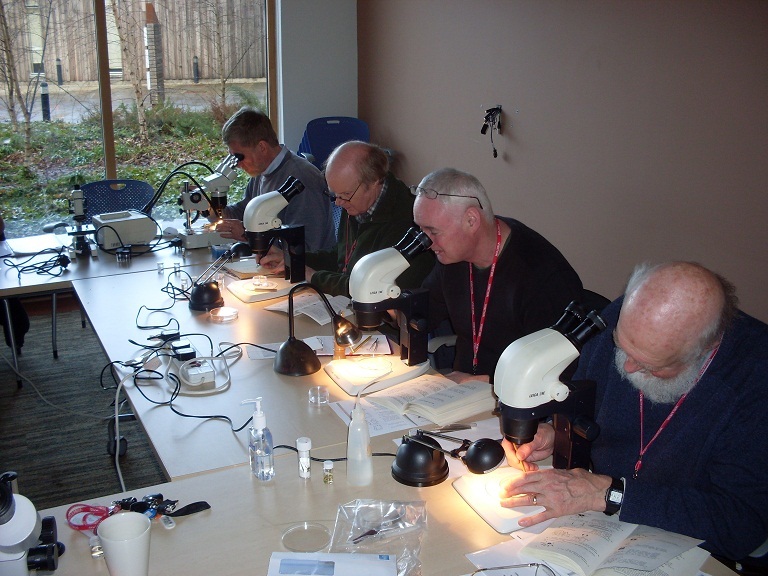 The subjects covered were bryophytes, dragonflies, lichens, molluscs and harvestmen and were taught by recognised experts in these groups. A total of 49 people attended the training courses, which were a great success.